Eric began his career in caring for animals when he worked as a vet tech for 5 years and doing behavioral work at the Humane Society. His heart would continually break when he would see people surrendering their pets because of behavioral issues. Knowing that nearly every behavioral issue can be fixed/managed with proper training he chose to pursue a career as a dog trainer/behaviorist. He is deeply motivated in helping people and their canine friends remain together. Eric is experienced in many methods of training as he recognizes that the only sure path to success is a path that the dog’s owner is comfortable using. Eric has been training dogs almost 12 years and has yet to meet a dog he couldn't help. Rachel is an OU graduate with a Bachelor of Science. She began working for Invisible Fence after college. This is when she discovered that her path to happiness would be one with dogs walking beside her. With her knowledge of biology and an understanding of how a good diet is just as important for dogs as it is for humans she began to delve into the world of canine nutrition. She has been providing nutritional counseling for 5 years to clients and has helped clear up many ailments such as sensitive stomach, skin allergies and even behavioral issues with strictly nutrition, no medications. Rachel has developed relationships with local pet stores to ensure that her clients have a convenient place to get healthy food and treats for their dogs. Rachel is often found behind a camera lens photographing her favorite subject, dogs. Charlie is a 10-year old American Field Lab. 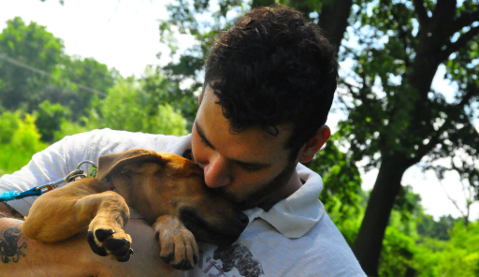 He works full-time with Eric helping to evaluate and socialize dogs. Rachel adopted him at 8-weeks old. Charlie is vital to Dog’s Way Training Club (DWTC). He is a true representative of DWTC’s mission, to create a healthy, happy, well-mannered dog while still being able to be a dog. Charlie is also a certified therapy dog. When not working he loves playing Frisbee, keep away and getting hugs. Gus also works full-time. 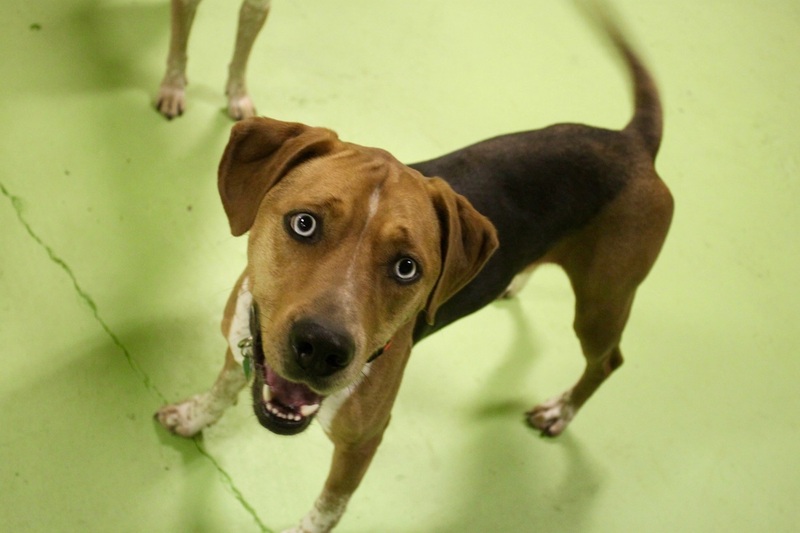 He is a 6-year old American Foxhound mix. Eric and Rachel fostered him, his brother and his mom. It only took a few days for Eric and Rachel to decide that Gus was going to be a member of the Willaert Pack. Gus is extremely high-energy and is happiest when he has a job to do. He loves to run, catch Frisbees, learn new tricks and climb trees. He has an unmistakable voice and is truly a hound at heart. Buddy is an 9-year old Anatolian Shepherd mix. Eric adopted him from Macomb County Animal Control. He was dog and people aggressive. Eric and Buddy have quite the bond as they both learned from each other. Buddy now loves people and other dogs. Buddy is also quite the lady’s man, serving as Eric’s wingman for a while until Eric and Rachel began dating and his services were no longer needed. Now, Buddy charms the ladies for strictly his own benefit, getting lots of hugs and kisses. Sula is about 10 or 12-years old and was adopted from Faithful Friends Animal Rescue. Eric was a trainer in Shelby Twp when he met Sula who was living in the puppy play room. She had had a puppy of her own and was a great momma dog. Sula was another foster that Eric and Rachel brought into their home and who quickly stole their hearts. Sula became an official Willaert when Eric and Rachel adopted her shortly after they were married in 2011. Sula is the life of the party and has proved invaluable at helping socialize dogs and puppies. Sula is a typical bully breed and is all about the love and is always ready to cuddle and give kisses. Ghost (formaly Bailey) came into our lives after an incident with the mailman. We were called in for training after the incident but sadly the family was still unable to keep him. We took him into our home thinking we would adopt him out after a little more obedience. With in hours we knew WE were his forever family. Not only did we fall in love with him instantly but so did our whole pack. He fit in seamlessly. He is a great addition to our family and continues to help us socialize dogs. Our preferred collar for your Off Leash option.